Idaho Fire Information: Snake River Hotshots are HIRING! 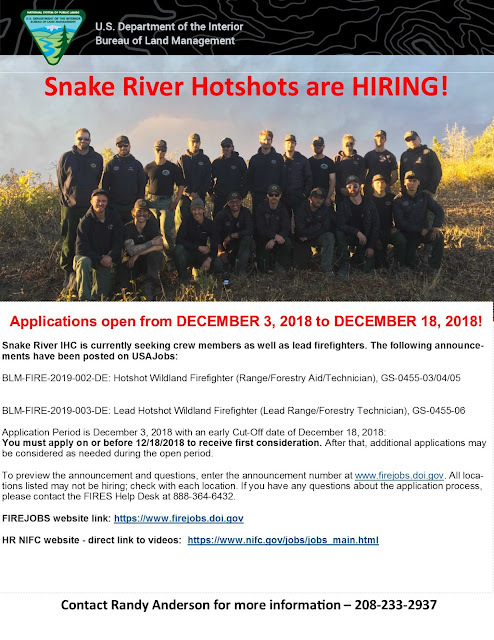 Snake River Hotshots are HIRING! You must apply on or before 12/18/2018 to receive first consideration. After that, additional applications may be considered as needed during the open period. To preview the announcement and questions, enter the announcement number at www.firejobs.doi.gov. All locations listed may not be hiring; check with each location. If you have any questions about the application process, please contact the FIRES Help Desk at 888-364-6432. The Snake River Hotshots are a Type I Interagency Hotshot Crew dedicated to wildland fire suppression. The crew is stationed in Pocatello, Idaho. In December 2014, the Snake River Hotshots moved into a new facility on South Valley Road. For the first time since the crew's inception in 2001, we have our own building, with space for classroom training, offices, and physical training, as well as a workshop and garage. The location of the facility near the new Cheyenne Crossing interconnect allows us to access the City of Pocatello's greenbelt trail system for additional physical training opportunities. The crew members of the Snake River Hotshots come from a wide range of races, faiths, gender, education and regional backgrounds. We maintain a non-threatening work environment where all crew members are encouraged to actively participate in an ongoing commitment to excellence. But our schedule is difficult for many college students due to the length of the season (early May through October). Please do not apply if you cannot commit to this time frame. After due consideration for safety, the Snake River Hotshots may volunteer for a variety of assignments. This includes working in the most physically challenging terrain. Smoke, heat, rain, snow, darkness, steep hills, close proximity to extreme fire behavior, and inadequate rest are common work conditions. Shifts can exceed 16 hours. We are away from our homes, families, and friends for weeks at a time. When fire assignments are not available, we keep busy with classroom and physical fitness training and fuels reduction projects. At times we conduct fuels work away from our home district. The month of October is almost exclusively dedicated to local fuels projects consisting of cutting and piling and some burning. The Snake River Hotshots firmly believe physical conditioning is directly related to safety on the fire line; thus the physical training regimen is demanding. Daily conditioning consists of stretching, running, power hikes, and some weight training. We cannot stress enough the importance of all potential crew members to get into shape prior to the season. Crew members and supervisors are also expected to arrive physically fit at the beginning of each fire season.